Mark expressed that he wanted customers to treat him with more respect and wanted to talk more with the end users (the people he delivered to). On this same subject, Brenton said that he would like to talk to people LESS because it reduced his efficiency doing the job.While Mark viewed his job as important within the larger context of the University, Brenton did not seem to care about his work other than that it helped him get to the next step in life (paying bills to transfer schools). To compromise, we brainstormed what they had in common. It turned out that all they shared was the cart with which they delivered packages. Our prototype design was largely based around this. Brenton explained that he hated going back and forth carrying heavy packages when he did not know if the person who ordered it was going to be at their office. To design for this need, we created a receipt printer where Brenton could leave a note with the date and time on the doors of the offices he tried to visit. We originally thought of doing this in a more graphic, spray-paint way, since Brenton is an artist, but that seemed too unrealisitic. Mark explained that he “wanted people to see him” as an individual human being. To design for this, we created unique “name-tags” for each of the ERSO delivery staff. Each member had their own unique font. The focus of our prototype is to help humanize Mark and Brenton, letting their customers know that they are individual people rather than just the arms of a faceless organization. We also want to help them in their job: we focused on their frustration with trying to deliver a package only to find that the person isn't in the office. With our prototype, Brenton and Mark can use a series of dials to set a time and day that they will return, as well as select their own name for a personalized template. When they hit the print button, an internal receipt printer creates a custom tag for them to stick onto the package recipient's door or desk. The bear is driven by four potentiometers and a switch with a simple pulldown resistor. 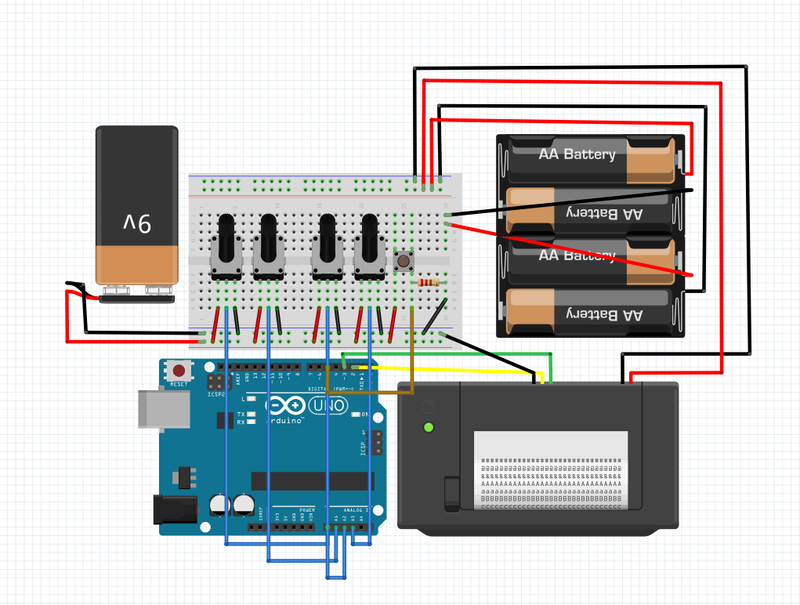 The thermal printer is powered by a set of 4 AA batteries, and the Arduino controlling the system has a 9V battery for juice. In essence, the code waits for a button press, then reads the values of all the potentiometers and generates some text and images to be sent out to the thermal printer for printing. Also in the code are some image headers: these are encoded versions of files saying "Mark" "Will" and "Brenton" in unique fonts to personalize their notes. They were encoded using Adafruit's processing sketch from their Thermal Printing library. 1 / 2 • Additional settings could select whether they want to redeliver or wait for the customer to contact them. Also, changing from two knobs to a single clock would make time indication easier. We'd like to explore several things in the future: what other kinds of personalization might be useful or fun? How can we make our prototype as small and robust as possible? How can we best integrate with their current workflow? could we print on something already sticky? can we make it smaller, so that it doesn't get in the way of the package delivery? can it have multiple messages? Instead of always redelivering, they want options to tell the person to call or come by to get their package. could we integrate a laser scanner? They have to laser scan their packages, and having all their tools in one physical object would be ideal! can we make it easier to reload and recharge? For a real design to work, they would need to be able to maintain it themselves. It is an stl file for 3d printing. This is the wiring diagram for the circuit inside. Just follow it! This is code for an Arduino. text via a thermal printer at the push of a button. Based on example code from Thermal.h library and Tom Igoe's AnalogIn example.